A raincoat is a functional, lightweight single- or double-breasted waterproof coat, worn as protection from the rain. One of the most typically British of men's coats, it was created when Scottish chemist Charles Macintosh patented a waterproof fabric in 1823 and his name has become synonymous with the raincoat ever since. A raincoat, which is closely related to the riding mac in cut and color, should be cut large enough to fit over a suit, with a one-piece raglan sleeve (or with setin sleeves and broad shoulders to accommodate wide-shouldered jackets), Prussian collar, and metal eyelets under the armpits to allow the arms to breathe. Although not all outerwear needs to be waterproof, up to the turn of the nineteenth century the majority of outerwear on the market could not repel water unless specifically treated with oil. There had been many attempts to waterproof fabric effectively in the early part of the nineteenth century, but the actual method discovered by Charles Macintosh in the early 1820s was in fact intended for use for tarpaulin. He described his patented material as "'India rubber cloth," whereby the texture of hemp, flax, wool, cotton, and silk, and also leather, paper, and other substances may be rendered impervious to water and air. It was made as a "sandwich" of two pieces of material surrounding a core of rubber softened by naptha. Macintosh warned tailors that the coats sewn from this material (without special precautions) would leak because of needle holes, but the "India rubber cloth" was deemed such a success that tailors hurried to try to use it nevertheless. After some time Macintosh was forced to open his own shops to make coats with properly waterproofed seams in order to protect his reputation. His tartan-lined rubber cloth coat with fully sealed seams remains the iconic raincoat. However, because temperature always rises in the rain and because rubberized cloth is nonporous, the raincoats were liable to make the body perspire when worn. London manufacturer George Spill discovered a solution to this by inserting metal eyelets under the armpits; such eyelets continue to be used in many raincoats. During World War I, Thomas Burberry devised a weatherproof coat for the officers in the trenches, made of a fine-twilled cotton gabardine that was put through a chemical process to repel water while allowing the fabric to breathe. The "trench coat" was not totally waterproof, but was effectively water resistant under most weather conditions and the raglan sleeves, which allow for ease of movement, as well as the gabardine fabric used, became the norm for waterproof coats of later years. 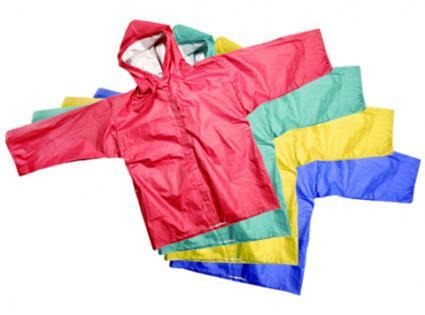 Basic styles of raincoats have changed little since World War II, but raincoats for both men and women started being offered in a wide range of colors, in contrast to the older tans and grays that once were the only colors available. 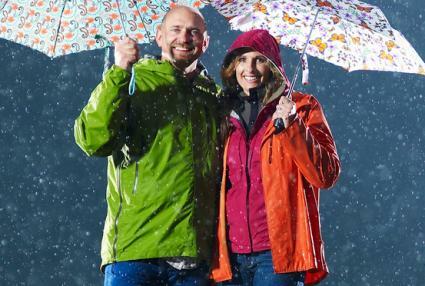 Advances in fiber and fabric technology, including surface treatments of fabrics, have made modern raincoats more water-repellent than ever before. Although men and women in the early twenty-first century rely on cars, trains, and buses to protect them on the way to work-and the raincoat remains a business overcoat-the raincoat remains as popular a form of protection from the rain as it was when it was first conceived. See also Outerwear; Rainwear; Umbrellas and Parasols. Hardy Amies. A, B, C of Men's Fashion. London: Cahill and Co Ltd., 1964. Wilkins, Christobel. The Story of Occupational Costume. Poole: Blandford Press, 1982.